Blogger is the biggest blogging platform, where you'll be ready your blogging and site-building carrier for free and host unlimited articles, images along with videos but after you upload any kind of image in your blog posts then it's going to be automatically upload on Picasa. You might take a back up your most images simultaneously from Picasa and we'll soon share a whole tutorial about this topic but today many of us will likely to show you a strategy to resize your blog posts all published images simultaneously. Blogger likely provide a person some capabilities to resize your current images but it doesn't help us lots to resize each of our all pictures, so we will have to add little CSS coding inside our blog to resize all blog posts images at once. So lets start the tutorial. How to Resize All Images At Once? 1. Go to Blogger Dashboard>> Template>> Edit HTML. 2. Find ]]></b:skin> in your template. After adding above coding in your template, we need to make some changes in it and design it according to our need because every blog and website have different layout size, so you can change its width and height that fit on your post images. Simply Change width: 480px with your desired value. If you also want to change default height then simply change height: auto with your desired height pixels. Know after Customizing height and width then simply click on “Save Template” and you’re done. 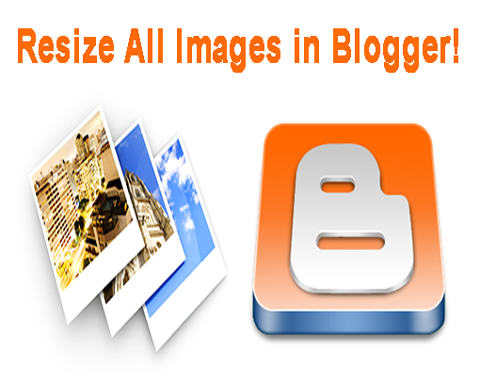 It is an easy trick to resize all your blogger posts images at once and bring more professionalism to your blogger blog. Now It's your turn to share this post and write your views in comments till then Happy Resizing.